Haiti should adopt domestic legislation setting out clearly the circumstances for the lawful use of force by the police, including for use of firearms, and underpinning the duty to investigate potentially unlawful police shootings. The use of any unnecessary force or restraint in arresting a person or in maintaining him in detention, or the application of any psychological pressure or physical brutality, especially during interrogation, is forbidden.Art. 25, 1987 Constitution of the Republic of Haiti (as amended). Its organisation and operation are regulated by the law.Art. 269(1), 1987 Constitution of the Republic of Haiti (as amended). The Haitian National Police ("Police Nationale d’Haïti"; PNH), is Haiti's national law enforcement agency. It was established in 1995 to bring public security under civilian control. The 1994 Law that created the PNH is the primary legislation regulating the Haitian National Police, but it does not regulate explicitly the use of force.Loi relative à la Police nationale, Loi du 29 novembre 1994 Portant création, organisation et fonctionnement de la Police nationale. Instead, police use of force is regulated by an internal regulation: General Order No. 003 of the National Police. According to this instrument, a police officer should use force only within the limits of what is strictly necessary to neutralise the resistance to the legal intervention of a police officer. Excessive or unnecessary force is strictly prohibited. Arrest an individual already known to have committed a crime involving the influction of death or bodily injury on others and in the knowledge that the offender's escape could lead to serious injury or death to others. We ought to have a very strong police oversight capacity, to address not only issues of human rights violations and the excessive use of force by police officers, but also questions of corruption among the staff. by the fact that cases of firearm deaths caused by agents of the security forces continue to be reported and that this number has increased in 2014. Despite the information provided by the State party to the effect that the perpetrators are punished, the Committee finds it regrettable that they are mainly subject to disciplinary sanctions and that statistics on homicides, and on investigations and prosecutions for homicide, are not routinely maintained or made publicly available.Human Rights Committee, Concluding Observations on Haiti, UN doc. CCPR/C/HTI/CO/1, 21 November 2014, §10. look into these cases of firearm deaths caused by the forces of law and order and ensure that they are investigated in a prompt and effective manner, prosecute those thought to be responsible and, if they are found guilty, sentence them to penalties in proportion to the seriousness of the acts and grant appropriate compensation to the victims and their families.Human Rights Committee, Concluding Observations on Haiti, UN doc. CCPR/C/HTI/CO/1, 21 November 2014, §10. guarantee that the General Inspectorate of the National Police is able to carry out these investigations independently and to routinely maintain statistics on homicides committed by the forces of law and order and on the unlawful use of firearms, covering investigations carried out, prosecutions brought, penalties prescribed and reparation awarded.Human Rights Committee, Concluding Observations on Haiti, UN doc. CCPR/C/HTI/CO/1, 21 November 2014, §10. continue its efforts to provide the forces of law and order with human rights training in accordance with its obligations under the Covenant and in line with the Basic Principles on the Use of Force and Firearms by Law Enforcement Officials, in order to reduce the incidence of homicide and serious injury caused by firearms.Human Rights Committee, Concluding Observations on Haiti, UN doc. CCPR/C/HTI/CO/1, 21 November 2014, §10. 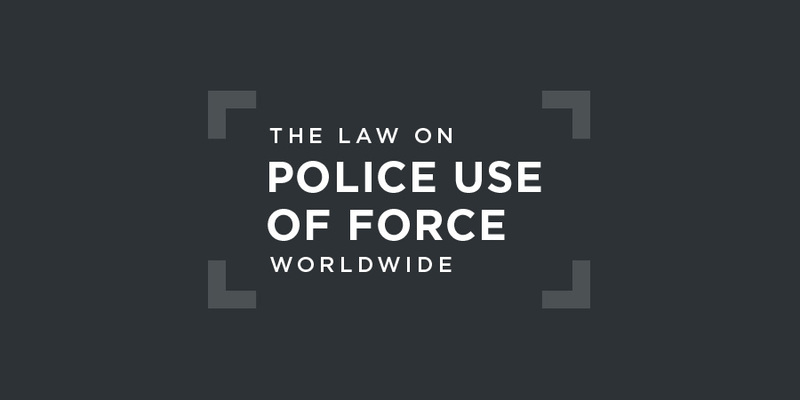 The legitimate use of force by State law enforcement officials must be limited by the principles of exceptionality, necessity, proportionality and humanity. Furthermore, domestic law must establish clear guidelines regulating the use of force, and the State must train its law enforcement officials on the protection of human rights and the limits to which the use of weapons must be subject. Finally, procedures must be in place to determine whether the lethal force used by agents of the State was legal. There were isolated allegations of police and other government officials’ involvement in arbitrary or unlawful killings. Some of these resulted in arrests, but there were no reports of criminal convictions. The Office of the Inspector General (OIG) of the Haitian National Police ... investigated 10 police officers for homicide while on duty through August. The OIG found that six of the officers were not justified in their use of force and recommended them for immediate dismissal and criminal investigation. The United Nations has encouraged the revision of the national regulatory regime in Haiti regarding police use of force, an issue which has been under discussions by the authorities since 2014.